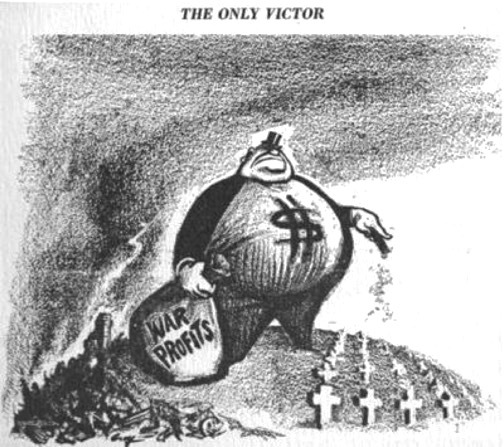 Laura Gray’s cartoon from the front page of The Militant August 18, 1945, under banner headline: “There Is No Peace” During This Economic Crisis, Capitalism’s Three Point Political Program: 1. Austerity, 2. Scapegoating Blacks, Minorities, and ‘Illegal Immigrants’ for Unemployment, and 3. The Iron Heel. The year was 1637…..700 men, women and children of the Pequot Tribe, gathered for their “Annual Green Corn Dance” in the area that is now known as Groton, Conn. While they were gathered in this place of meeting, they were surrounded and attacked by mercernaries of the English and Dutch. The Indians were ordered from the building and as they came forth, they were shot down. The rest were burned alive in the building. 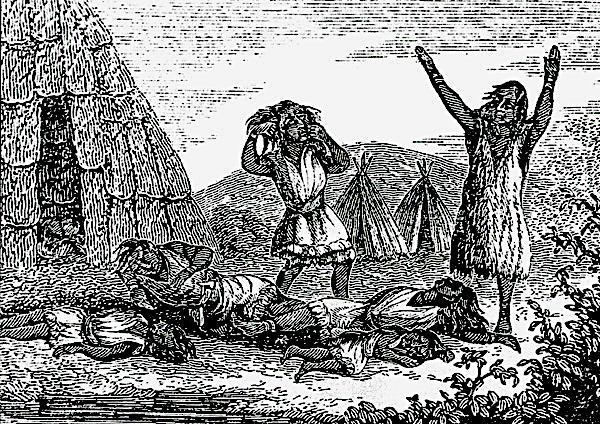 The English commander John Mason declared that the attack against the Pequot was the act of a God who “laughed his Enemies and the Enemies of his People to scorn making [the Pequot] as a fiery Oven . . . Thus did the Lord judge among the Heathen, filling [Mystic] with dead Bodies.” The Narragansett and Mohegan warriors with the English were horrified by the actions and “manner of the Englishmen’s fight . . . because it is too furious, and slays too many men.” The Narragansett returned home and no longer participated in the war. This image is courtesy of forquignon.com. The rest of the white folks thought so, too. This day forth shall be a day of celebration and thanksgiving for subduing the Pequots, read Massachusetts Bay Governor John Winthrop’s proclamation. The authentic proclaimed Thanksgiving Day was born. Few Pequots survived. 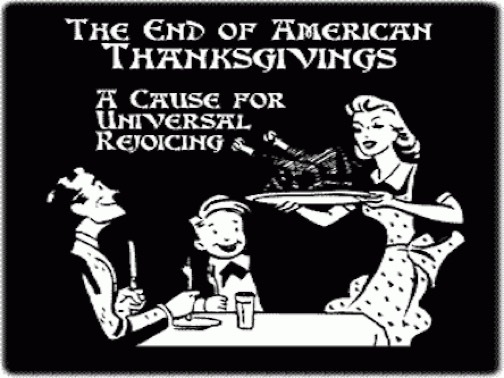 The next day, the Governor of the Massachusetts Bay Colony declared : “A day of Thanksgiving, thanking God that they had eliminated over 700 men, women and children. For the next 100 years, every “Thanksgiving Day” ordained by a Governor or President was to honor that victory, thanking God that the battle had been won. Native Americans have the highest mortality rate of any U.S. minority because of U.S. action and policy. The biggest killers though were smallpox, measles, influenza, whooping cough, diphtheria, typhus, bubonic plague, cholera, and scarlet fever. All imported by the Europeans colonists. As Thanksgiving approaches, many schools throughout the U.S. are making preparations for the standard, and all too cliché, Thanksgiving Day lessons, and fairy tale-esque Thanksgiving plays. 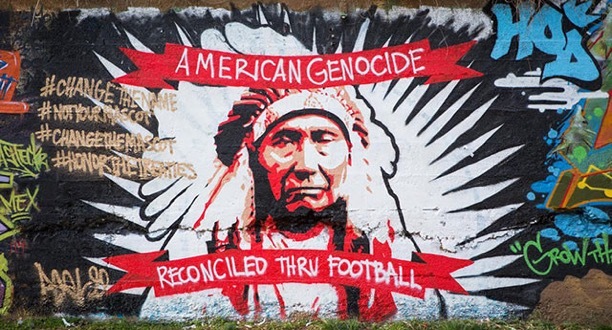 And more often than not, the school Thanksgiving activities are largely based on what ultimately amounts to myth, created to serve the imaginations of the dominant society, and simultaneously functioning to erase the tragedies of Indigenous nations. The myth usually goes a little something like this: Pilgrims came to America, in order to escape religious persecution in England. Living conditions proved difficult in the New World, but thanks to the friendly Indian, Squanto, the pilgrims learned to grow corn, and survive in unfamiliar lands. It wasn’t long before the Indians and the pilgrims became good friends. 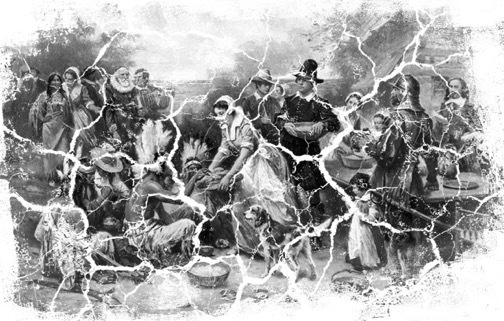 To celebrate their friendship and abundant harvest, Indians in feathered headbands joined together with the pilgrims and shared in a friendly feast of turkey and togetherness. Happy Thanksgiving. The End. From this account, the unsuspecting child might assume a number of things. Firstly, they may assume that pilgrims merely settled the New World, innocently, and as a persecuted people, they arrived to America with pure and altruistic intentions. Secondly, children might assume, and rightfully so, that Indians and pilgrims were friends, and that this friendship must have laid the framework for this “great American nation.” So, what exactly is the harm in this school-sanctioned account of history? Understandably, the untrained eye may not notice the harm in such a myth, as most Americans are victim to the same whitewashed lie as the rest, and dismantling a centuries-old myth certainly does prove challenging. I speak to you as a man — a Wampanoag Man. I am a proud man, proud of my ancestry, my accomplishments won by a strict parental direction (“You must succeed – your face is a different color in this small Cape Cod community!”). I am a product of poverty and discrimination from these two social and economic diseases. I, and my brothers and sisters, have painfully overcome, and to some extent we have earned the respect of our community. We are Indians first – but we are termed “good citizens.” Sometimes we are arrogant but only because society has pressured us to be so. It is with mixed emotion that I stand here to share my thoughts. This is a time of celebration for you – celebrating an anniversary of a beginning for the white man in America. A time of looking back, of reflection. It is with a heavy heart that I look back upon what happened to my People. 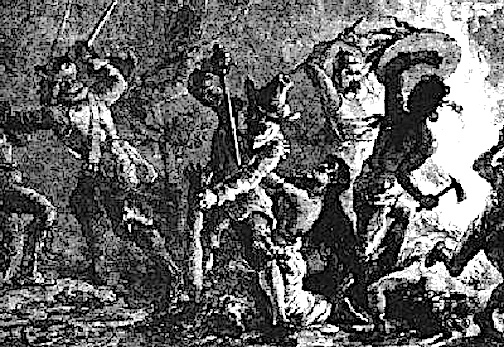 Even before the Pilgrims landed it was common practice for explorers to capture Indians, take them to Europe and sell them as slaves for 220 shillings apiece. The Pilgrims had hardly explored the shores of Cape Cod for four days before they had robbed the graves of my ancestors and stolen their corn and beans. Mourt’s Relation describes a searching party of sixteen men. Mourt goes on to say that this party took as much of the Indians’ winter provisions as they were able to carry. Massasoit, the great Sachem of the Wampanoag, knew these facts, yet he and his People welcomed and befriended the settlers of the Plymouth Plantation. Perhaps he did this because his Tribe had been depleted by an epidemic. Or his knowledge of the harsh oncoming winter was the reason for his peaceful acceptance of these acts. This action by Massasoit was perhaps our biggest mistake. We, the Wampanoag, welcomed you, the white man, with open arms, little knowing that it was the beginning of the end; that before 50 years were to pass, the Wampanoag would no longer be a free people. And so down through the years there is record after record of Indian lands taken and, in token, reservations set up for him upon which to live. The Indian, having been stripped of his power, could only stand by and watch while the white man took his land and used it for his personal gain. This the Indian could not understand; for to him, land was survival, to farm, to hunt, to be enjoyed. It was not to be abused. We see incident after incident, where the white man sought to tame the “savage” and convert him to the Christian ways of life. The early Pilgrim settlers led the Indian to believe that if he did not behave, they would dig up the ground and unleash the great epidemic again. Has the Wampanoag really disappeared? There is still an aura of mystery. We know there was an epidemic that took many Indian lives – some Wampanoags moved west and joined the Cherokee and Cheyenne. They were forced to move. Some even went north to Canada! Many Wampanoag put aside their Indian heritage and accepted the white man’s way for their own survival. There are some Wampanoag who do not wish it known they are Indian for social or economic reasons. What happened to those Wampanoags who chose to remain and live among the early settlers? What kind of existence did they live as “civilized” people? True, living was not as complex as life today, but they dealt with the confusion and the change. Honesty, trust, concern, pride, and politics wove themselves in and out of their [the Wampanoags’] daily living. Hence, he was termed crafty, cunning, rapacious, and dirty. History wants us to believe that the Indian was a savage, illiterate, uncivilized animal. A history that was written by an organized, disciplined people, to expose us as an unorganized and undisciplined entity. Two distinctly different cultures met. One thought they must control life; the other believed life was to be enjoyed, because nature decreed it. Let us remember, the Indian is and was just as human as the white man. The Indian feels pain, gets hurt, and becomes defensive, has dreams, bears tragedy and failure, suffers from loneliness, needs to cry as well as laugh. He, too, is often misunderstood. The white man in the presence of the Indian is still mystified by his uncanny ability to make him feel uncomfortable. This may be the image the white man has created of the Indian; his “savageness” has boomeranged and isn’t a mystery; it is fear; fear of the Indian’s temperament! Even before the Pilgrims landed it wascommon practice for explorers to capture Indians, take them to Europe andsell them as slaves for 220 shillings apiece. High on a hill, overlooking the famed Plymouth Rock, stands the statue of our great Sachem, Massasoit. Massasoit has stood there many years in silence. 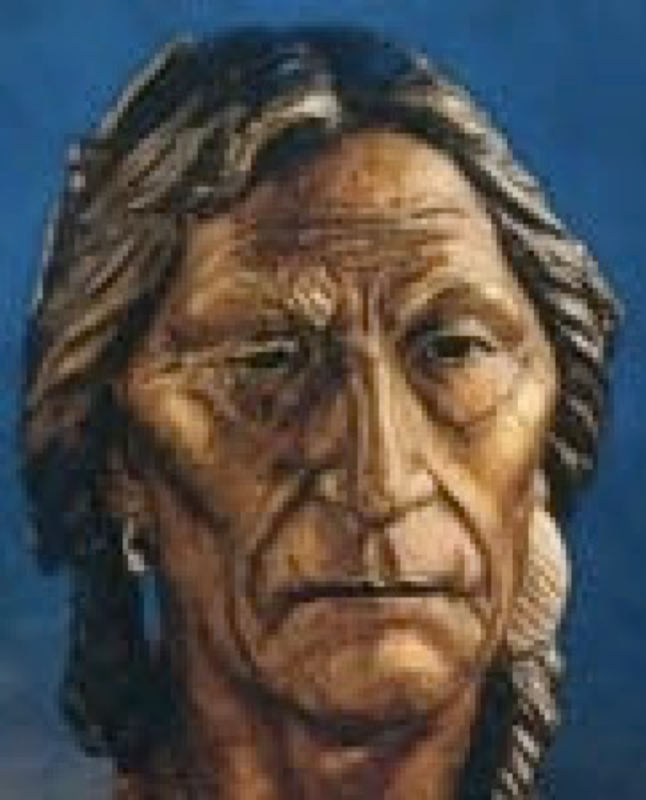 We the descendants of this great Sachem have been a silent people. The necessity of making a living in this materialistic society of the white man caused us to be silent. Today, I and many of my people are choosing to face the truth. We ARE Indians! Although time has drained our culture, and our language is almost extinct, we the Wampanoags still walk the lands of Massachusetts. We may be fragmented, we may be confused. Many years have passed since we have been a people together. Our lands were invaded. We fought as hard to keep our land as you the whites did to take our land away from us. We were conquered, we became the American prisoners of war in many cases, and wards of the United States Government, until only recently. Our spirit refuses to die. Yesterday we walked the woodland paths and sandy trails. Today we must walk the macadam highways and roads. We are uniting We’re standing not in our wigwams but in your concrete tent. We stand tall and proud, and before too many moons pass we’ll right the wrongs we have allowed to happen to us. We forfeited our country. Our lands have fallen into the hands of the aggressor. We have allowed the white man to keep us on our knees. What has happened cannot be changed, but today we must work towards a more humane America, a more Indian America, where men and nature once again are important; where the Indian values of honor, truth, and brotherhood prevail. You the white man are celebrating an anniversary. We the Wampanoags will help you celebrate in the concept of a beginning. It was the beginning of a new life for the Pilgrims. Now, 350 years later it is a beginning of a new determination for the original American: the American Indian. 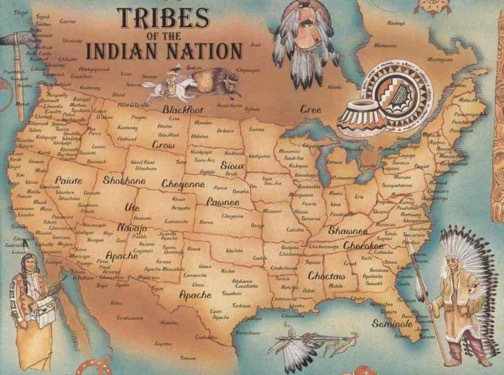 There are some factors concerning the Wampanoags and other Indians across this vast nation. We now have 350 years of experience living amongst the white man. We can now speak his language. We can now think as a white man thinks. We can now compete with him for the top jobs. We’re being heard; we are now being listened to. The important point is that along with these necessities of everyday living, we still have the spirit, we still have the unique culture, we still have the will and, most important of all, the determination to remain as Indians. We are determined, and our presence here this evening is living testimony that this is only the beginning of the American Indian, particularly the Wampanoag, to regain the position in this country that is rightfully ours.